Last spring, I found an an old CCM with a Garry head badge at EBC in extremely rough shape and began fixing it up. It was initially intended to be sold at EBC, but there is so much damage to the frame, hubs and wheels that it couldn’t be sold as a practical, rideable bike. 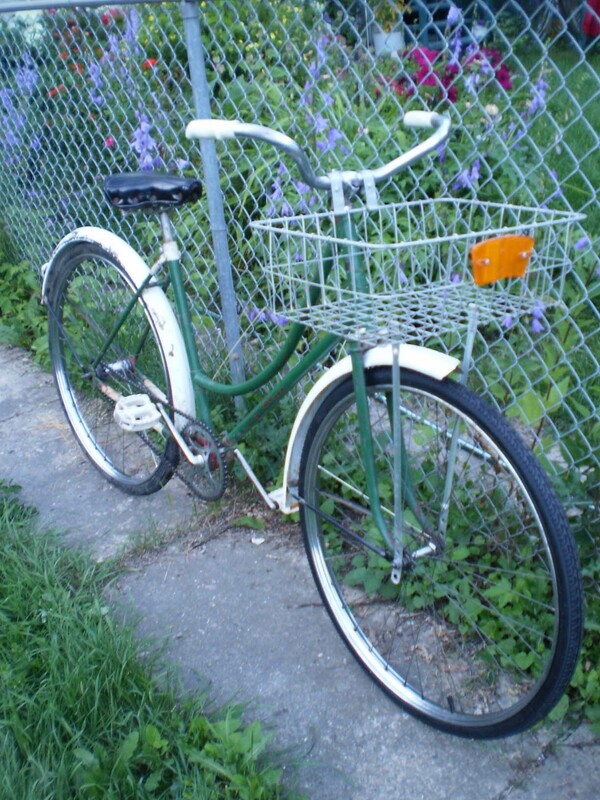 I dubbed her “Poplar” and decided to follow through on the repairs anyway, so I could learn more about vintage bikes and hopefully get at least one sweet ride out of her instead of going into the scrap metal heap. My one sweet ride came via Critical Lass. The second time I rode her, to the Bikeology Festival, her tire exploded on the way home, during a sudden downpour. Bam! And, there's no fixing that tire. BTW, nobody believes those are mechanic's hands, my secret is Worx and good keratin production genes. 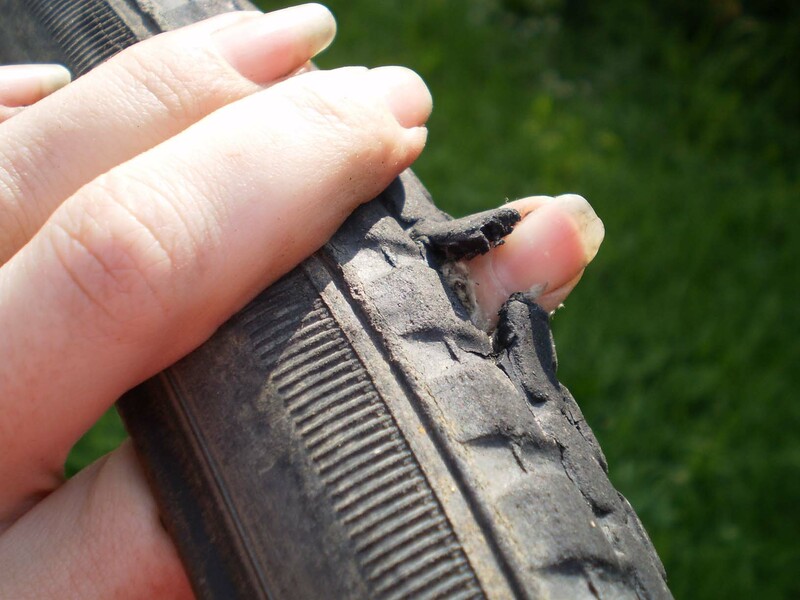 Replacing a tire is not a big deal, except Poplar has 28″ Canadian size tires, and I had to wait close to a month for a new specimen of that oddball sized rubber. 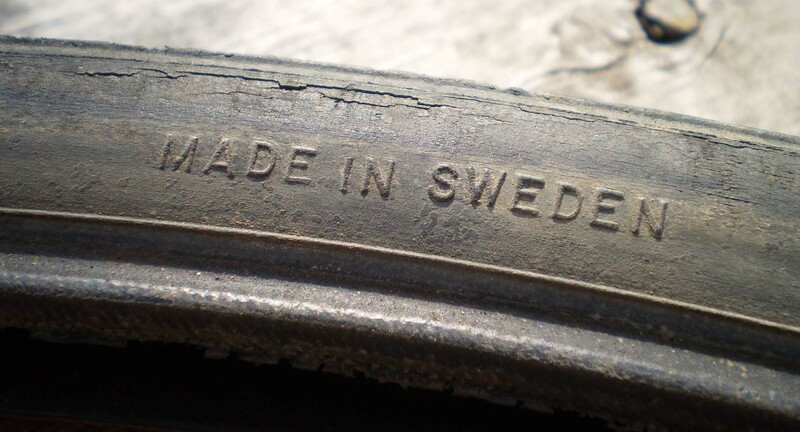 Canadian size - translates to "good luck finding a replacement"
Canadian size, made in Sweden? 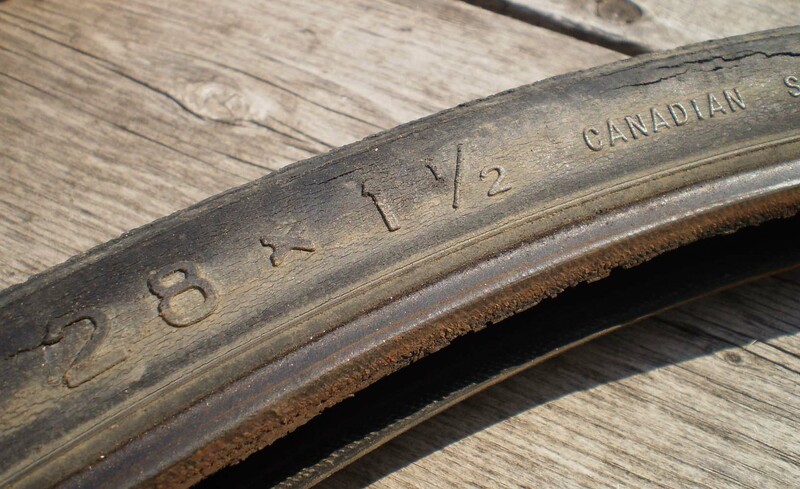 The replacement tire was made in Taiwan. 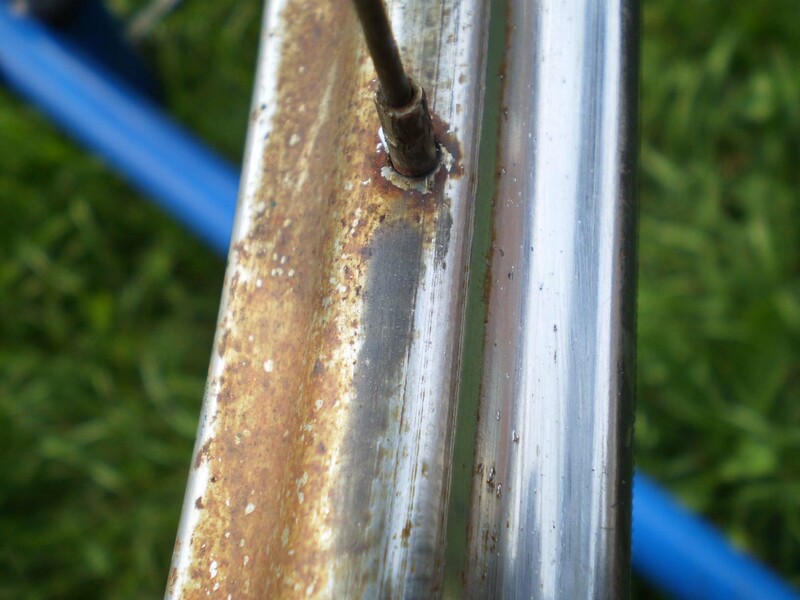 After changing the tire, I decided to work on six decades of rust using the secret recipe for rust removal from Loop Frame Love: aluminum foil and lemon juice. To the left, clean but rusty rim. To the right, shiny after being rubbed with aluminum foil moistened with lemon juice. There was a point, possibly even on the first night I worked on this bike, that I knew I’d spend more time fixing it up than I would riding her. So far, I’ve overhauled both hubs, trued the wheels (which included some serious banging to bend back the rims), replaced a bunch of spokes, tightened the bottom bracket, spent hours and hours scraping off 60 years of WD-40, poplar sap and weed overgrowth, bent the fork, the rear triangle and both sets of dropouts back into shape, and replaced the grips and pedals. I have used more brute force on this bike than any other I’ve ever worked on (which is pretty amazing, given my experience with winter bikes), but there are still things, like the bent steerer tube now mounted permanently in the head tube, that no amount of muscle can fix. New tire & new shine! I also added a basket that, fittingly, had bent stays that also can't take a load. I feel like I want to take this bike to some sort of completion, not necessarily restored to its original state, given the state of the frame it just wouldn’t be worth the investment, but restored to a semblance of both function and prettiness (BTW, I’d be very interested to find a set of 1/2 inch rubber pedals). This will never be a bike I’d feel comfortable riding fast or far from home, but I think I do want to take the last major step in sprucing her up and give her a new paint job. There is burgundy paint underneath the green, and on the fork there is a sparkly blue paint under the burgundy and green, so I’ll take that into account when I decide what colours her new look will include. She’s a delightful little bicycle, and I hope she has at least a couple more special occasion rides left in her. Sheer curiousity: why is the fork & bent steerer permanent? Also, what are the main problems with the frame? I have seen bikes like this with what would seem to be terminal problems go many hundreds, if not thousands of miles. Your infusion of lifeblood could keep this undead velo rolling longer than you think. I need to remove the fork to fix the bent steerer tube (or better yet, replace the fork should I somehow find a replacement), but because of the bent steerer tube, I have (so far) been unable remove the fork. The headset bearings are adjusted well, so it makes me suspect that the head tube is also somewhat bent, and if so, I don’t know how to fix that if I can find a non-bent fork. The fork itself was bent way out of shape, and I bent it back best I could with it on the bike, but it’s still not quite right. This bike was obviously involved in a serious head-on collision, and has probably spent decades sitting outside rusting. It is so rusted out, that when Deb from Loop Frame Love brought Nicki’s nearly identical bike into BikeWorks, I realized Poplar’s frame & wheels weighed noticeably less than her’s. Undead zombie bike – lol! I’ve actually put close to 30 (slow) kilometers on this bike in the last 24 hours. For now, I’m taking a wait and see approach, as in I’m going to wait and see what breaks next. Dang! Rust is the new drillium! Sounds like you need a fork and stem to just drop into your lap, and then you can just cut the old one out – or not, as it seems to be rolling. Have fun! LOL! Thanks! Given my luck with things just falling out of the sky, it might happen, but I’m not going to hold my breath.